The artichoke installation ... has also inspired the new logo of Soulfull. 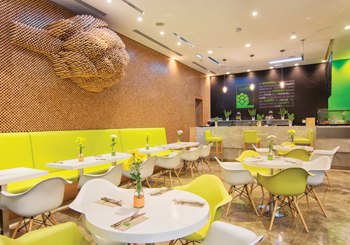 The artichoke is the central theme of the interiors of the new restaurant – the second Soulfull outlet in the UAE – which has been designed by Thomas Klein International (TKI), the region’s leading food and beverage consultant, to convey the essence of the outlet which is fresh and health-promoting. 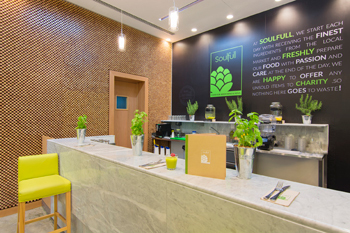 “Soulfull is a locally grown concept and offers diners a choice of fresh and healthy food, without compromising on the taste,” says Tamer Al Ali, head of operations for Soufull. “The well-balanced menu offers a unique variety of dishes high in essential nutrients. All dishes on the menu are rated from three to five stars, which makes an easier choice rather than counting calories. He continues: “We opened our first Soulfull restaurant in Abu Dhabi four years ago, and the opening of the DIFC branch marks the beginning of our expansion in the UAE. Fresh, healthy and creative ... core values that have inspired the Soulfull design. TKI has completed the design of the interiors and the technical specification for the kitchen of the Soulfull. Natural and raw materials such as wood, marble and concrete have been utilised throughout the design, and different shades of green have been selected for the upholstery, wall paint and graphics to create a natural and fresh feel. The wall behind the counter displays the branding via wall-covering graphics, whilst the main wall, fronting the entrance, becomes the focal point of the space, exhibiting an art installation designed by architects Paula Palombo and Eric Schall – the artichoke. The one-of-a-kind installation portraying a three-dimensional visual interpretation of an artichoke is made of several thousand wooden batons extending off the wall. “Our artichoke installation has also inspired the new logo of Soulfull, and all the new brand applications will now follow the artichoke image, thereby reflecting the core values of the Soulfull concept: nutritious, vitamin-filled, fresh, and health-promoting food,” adds During. Operating in the region since 2001, TKI provides professional consultancy services specialising in the hospitality, entertainment and leisure sectors, with a strong emphasis on food and beverage operations. The wall behind the counter displays the branding via wall-covering graphics. TKI has worked on a variety of projects for prestigious clients in the past, including Al Samadi Sweets and Café in the region; restaurants at Le Royal Meridien Abu Dhabi and Crème Royal pastry shop for The Royal Group in Abu Dhabi; Sharjah’s tourist destination Qanat Al Qasbah; and the central production kitchen at Dubai Industrial City, retail areas at Dubai Media City, Mövenpick Hotel Oud Metha Dubai and Wafi City, all in Dubai. It has also carried out projects elsewhere in the region including the Spazio restaurant at the Kingdom Tower in Riyadh, Saudi Arabia; and various independent and hotel restaurants for The Sultan Group in Kuwait, Sun City ventures in Bahrain, and Four Seasons Riyadh. The company was established with the aim of delivering a complete range of consulting, design and management services for investors and operators in the hospitality, entertainment and leisure sectors throughout the Middle East and beyond. Headquartered in Dubai, TKI’s international team serves the hospitality sector that includes hotels, restaurants, spas and retail. With additional offices in Madrid (Spain), Chicago (US) and Buenos Aires (Argentina), TKI has access to wide-ranging and intensive data that enrich every single project. The diverse and talented team members provide comprehensive and specialist skills that are tailored to the needs of each development. TKI is one of the few firms of its kind offering both complete business and design services, forming a hospitality consultancy that creates and establishes businesses that are innovative as well as profitable.